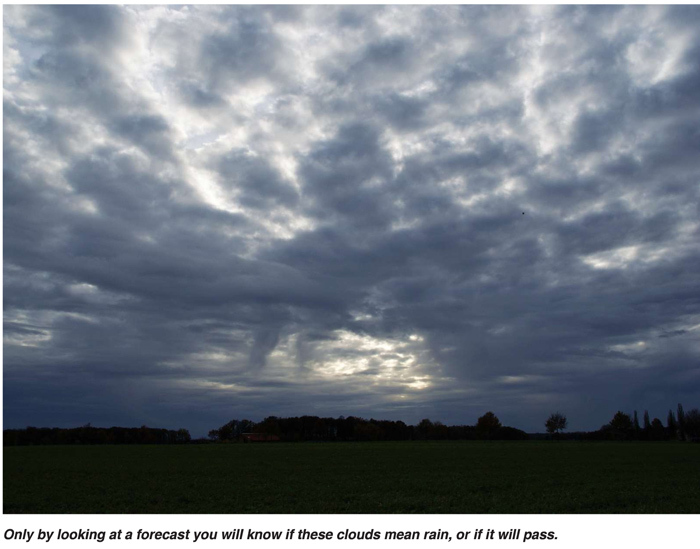 Ask any farmer in the game for a long time and he will tell you that weather predictions are often unreliable! So, what then is the point of learning more about weather? Producers are increasingly collecting many different kinds of weather data to inform their production and marketing decisions. There is a significant difference between the terms ‘climate’ and ‘weather’. The difference is in the measure of time. Climate – describes how the atmosphere behaves in a region over a relatively long period of time. Weather – describes local conditions over a short period of time. Weather can change from hour-to-hour and day-to-day, but climate is the average of the weather as measured over a longer period of time. Climate is therefore what can reasonably be expected, whilst weather is more dynamic and changeable. Annette Venter, eNCA weather announcer, recently said it is important to remember that weather is a chaotic system easily influenced by small daily changes which is why it is notoriously difficult to predict! Understanding weather patterns and long-term climate trends is especially relevant since the phenomenon of climate change has reared its ugly head and scientists are trying to identify changes to normal patterns. So, what is ‘climate change’? It is a high-profile environmental concern that is likely to have a profound impact on natural and human systems. Agri SA’s Kosie van Zyl, conducted a disaster risk management review of the South African agricultural sector in 2006 and concluded that significant changes are predicted for South Africa over the next 50 years. A warming of the African continent of between 1°C and 3°C, with maximum increases in arid regions and the minimum increased at the coast, is anticipated. Rainfall levels, anticipated to be between 5% and 10% less than current rainfall levels, will significantly reduce. Daily maximum temperatures in summer and autumn in the western half of the country will rise and there will be extended summer seasons, with some areas prone to increases in the occurrence of droughts and floods. The adverse effects of climate change were also addressed at the 2008 AgriSA Congress by Professor Colleen Vogel: The risk to Africa’s small-scale farmers, usually the most vulnerable stakeholders in the sector, with low adaptive capacity and coping with multiple other stresses, was also emphasised. Vogel called for focus on identifying best practice agriculture for climate risk reduction which should be taught to farmers to ensure sustainable livelihoods. What does it all mean? The variability in climate necessitates a change in the way we do things. Farmers can’t go on doing the same things in the same way and expect to achieve the same results in the same game. Instead of freaking out about these constraints, embrace them, let them guide you. Being better informed equals a better chance of success and survival. This is important in a challenging environment where farmers face pressures from uncertain politics, elusive economic success and the changing environment. South African farmers are well known for their proactive approach to new technologies. For example, some farmers in the Western Cape have converted apple orchards into vineyards because grapes require less water and are more tolerant of high temperatures. In the Southern Cape other farmers have abandoned cropping and are planting pastures to enhance water storage capacity. Many farmers have already adapted and are using new cultivars which they select according to the weather information they have received. For example, if a growing season is shorter due to late rains, a specific quick-growing cultivar is selected; or they might make the decision to plant an alternative, quick-growing crop like sunflowers. New technologies and new cultivars can make the difference between food security and famine. New drought-tolerant maize has been bred to give significant yield increases under drought stress and ‘more crop per drop’. Minimum till and no-till soil preparation are increasingly important – as is the focus on soil rehabilitation. Farmers in Lesotho have increased yields by adopting CSA, known locally as ‘likoti ’, by maintaining good mulch covering on the soil. This has increased soil fertility and reduced soil erosion. For people who live off the land it is quite normal to keep detailed records or notes from month to month and year to year. 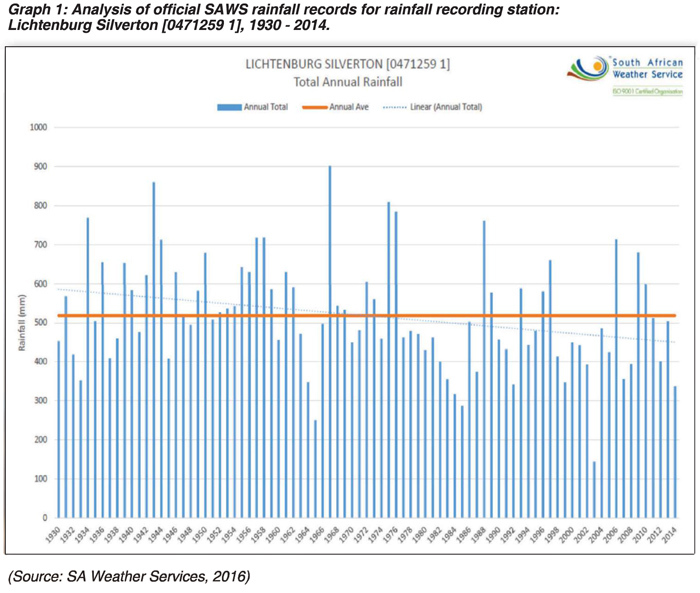 Rainfall records have been kept on our farm since 1929. This has been converted into an interesting graph (Graph 1). There are many interesting comments in the family record book which note the weather, the season or the yields in a particular year. Discuss seasonal weather predictions with experts. You can listen to regular broadcast reports on radio or television. You can also contact your local agribusiness to find where to get region-appropriate information. 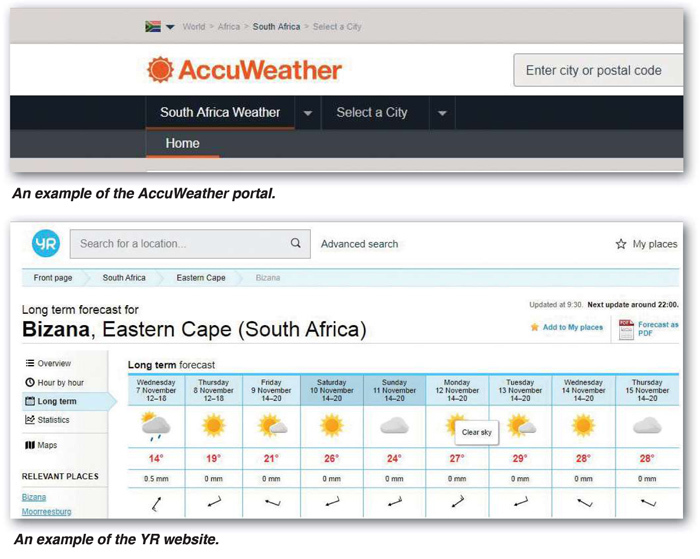 There are many useful apps which can be downloaded to give you minute-by-minute reports collected from satellite images like: YR, Weather & Radar SA and AccuWeather. Good risk management decision-making requires accurate information and reliable data. While never fully neutralising the element of farming risk, good information will always help one to anticipate potential problems and then make rational management decisions. Simply reacting to unfavourable conditions as they develop is not good management.